March 30, 2016 Multimedia & Design, Software, VideoLespeed Network Technology Co., Ltd. Wise Video Converter is an easy, fast and powerful software, which allows you to convert all formats of videos to be playable in all kinds of devices. All brands of devices supported including Cellphones, Pads, and PCs. The main surface is clean and friendly, and the conversion process of the software is easy and fast. Download and install following the instructions displayed step by step. After you have installed the software, click the icon and the clean main surface of the software will show up with three buttons of “Cellphone Device”, “Pad Device” and “PC Device” for you to choose from. Firstly please select your specific kind of device from the three buttons, click it and the guide will ask you to choose video(s) to convert. Select one by double-clicking and it will show up in the Convert List. Or you can just drag it to a certain kind of button. It will intelligently recognize the device and get categorized to certain output format. 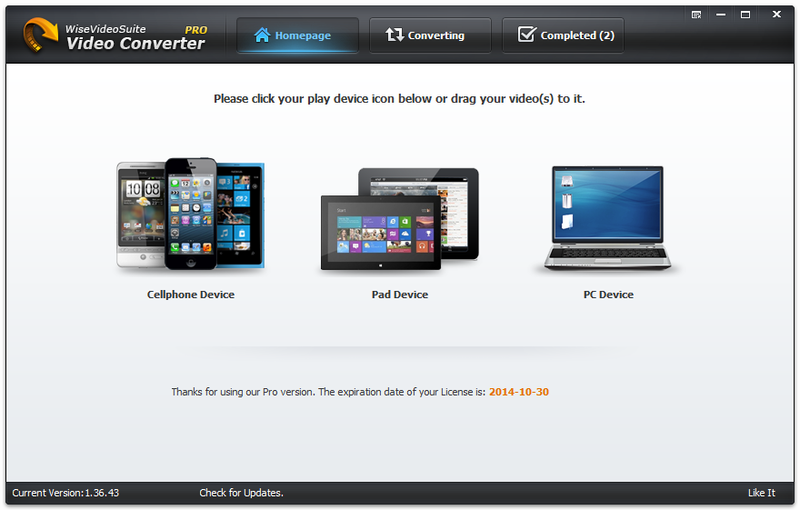 You can also drag your video to the Convert List, after which operation the default Device setting is Mobile. You can make any change in the round button next to the file at the right end of each item, which can show you the properties of the video and allow you to further change your output format. If you want to start conversion immediately, just click “convert” at the lower right corner and the conversion will start at once, during which process you can choose to pause, stop or continue. You can add a batch of videos to the Convert List and only one click is needed to start convert them. After the file’s conversion is finished, it will show up in the converted list. In the list, you can open it, delete it, or open the file path of it. Easiest and Fastest thing to do! Wise Video Converter is so user-friendly, what’s more, you can generate a portable version of it in the Settings, which makes the software more convenient to use. Wrap it in your pocket and use it anywhere. Enjoy your videos with Wise Video Converter! Record Unlimited Online Music with a Click Online radio stations: Pandora, Spotify, Yahoo Music, Last.fm, AOL Radio, iTunes Radio, MySpace music, etc. ; Video sharing sites: YouTube, VEVO, Vimeo, Hulu, MTV, Break, LiveLeak, PhotoBucket, VH1 and so forth; Media player: iTunes, Windows Media Player, QuickTime, Real Player, DVD player, Flash and much more. Save Audio in M4A/MP3 with 100% Rriginal Quality – Ads Free! 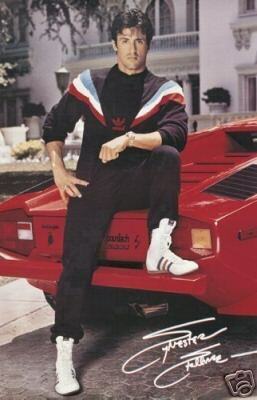 record online music without ads ? Record music in MP3/M4A Format This online music recorder will save your recorded audio in MP3/M4A encoder and at sample rates up to 48,000Hz and bit rate up to 256 kbps. ? Auto-split: Record music one after one With the help of the most accurate track splitting algorithms, Aimersoft Music Recorder will precisely split songs when silence exceeds the user-defined time. All songs will be recorded one after one. ? Auto-filter: Remove ads and insignificant noise It will also filter out unwanted noises like ads when the audio duration is less than preset minimum track length. Thus, all music will be recorded one by one, no more, no less. You don’t need to worry about any unwanted part or the missing of the start/end of the song. Songs recorded by this music recording program are just exactly what you want. Automatically Identify Music ID3 Tags Equipped with the intelligent recognition technology, it will intelligently tag artists, song titles, album covers, album names and genre information to each music files after recording. More than that, this music recording tool is also able to recognize the track information of your local music. 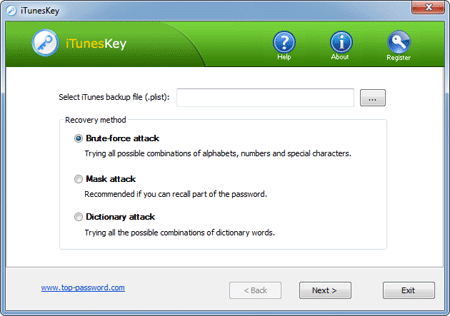 All the recorded audio tracks can be renamed and added to personal playlists or iTunes Library. Download videos from YouTube, Vimeo and more Save entire YouTube playlists with one click Convert downloaded videos to popular formats Download YouTube videos to MP3 and more Transform online videos to fit for different players Convert Downloaded Videos to Tons of Formats It help you convert any downloaded videos to virtually all popular video formats like AVI, WMV, MOV, MP4, 3GP, HD, 3D output and more. Besides, it also enjoys the ability to extract audio from downloaded videos and save them as MP3, WAV, WMA and so on. Transform Videos to Fit for Different Devices Aimersoft YouTube Downloader’s built-in video converter will help you to do this in a hassle free manner. It provides more than 100 optimized presets for different gadgets, which include Apple products like iPhone 5, iPad 4, iPod Touch 5, gaming devices like PSP, Wii and many other popular brand like Samsung, BlackBerry, Nokia, HTC, Sony, Motorola, Archos and more. Only with a few simple clicks, you can watch any YouTube, Hulu, Vimeo, etc. videos whenever and wherever possible. Watch Movies with Built-out HD Player Aimersoft YouTube downloader comes with an external high definition media player, which will play your local video and video downloaded from internet with super clear image and high quality sound effects. Besides, Aimersoft Player allows you to add subtitles to the loaded videos, adjust the frame size, choose different audio track and more. You can also create a personalized playback list and even take snapshots for your favorite scenes. Ziiosoft DVD Maker is a professional software to Convert and burn popular video formats, HD videos and camcorder videos taken by iPhone, downloaded Web videos and DV to DVD disc or saving as ISO files. with a diversifying range of DVD templates; you can create the most unique DVD out of ordinary video & audio files in minutes. In addition, you can burn your photos into a photo show like no other with your favorite background music and burn it to DVD. *Easily burn any video to DVD with high quality on Windows 8/7/XP/Vista. * Support burning HD video formats (MXF, XAVC, AVCHD MTS, AVCHD M2TS, TOD, etc) to DVD without harming the original quality. * Support exporting to DVD disc, DVD Folder, ISO files. * Add background picture or music to the DVD preview model. *Customize your DVD with gorgeous free DVD menu or templates. 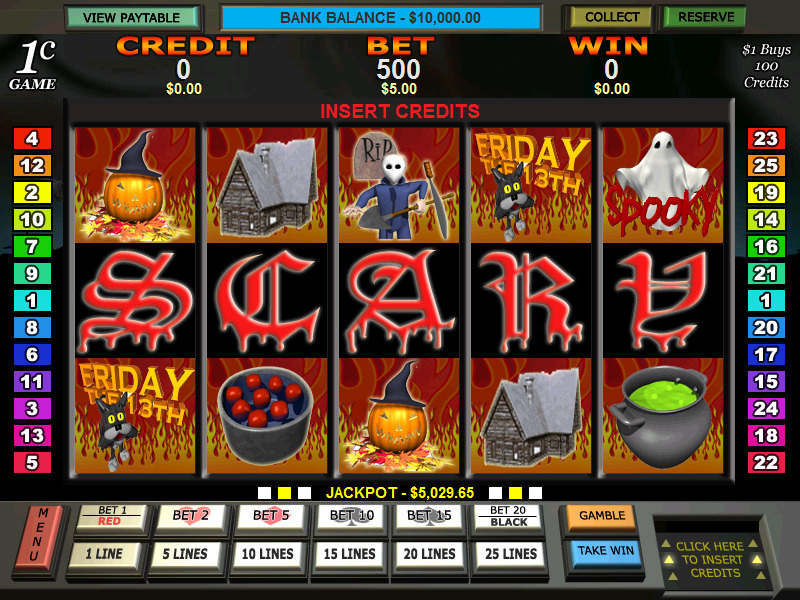 Scary Slots is a 5 reel, 25 payline slot machine (pokie) with a horror theme. Whenever the letters spell : S C A R Y anywhere on the reels the feature is won. When the Feature is won, you can choose one of the following: – 8 Free games with all wins multiplied by 5. – 12 Free games with all wins multiplied by 4. – 15 Free games with all wins multiplied by 3. 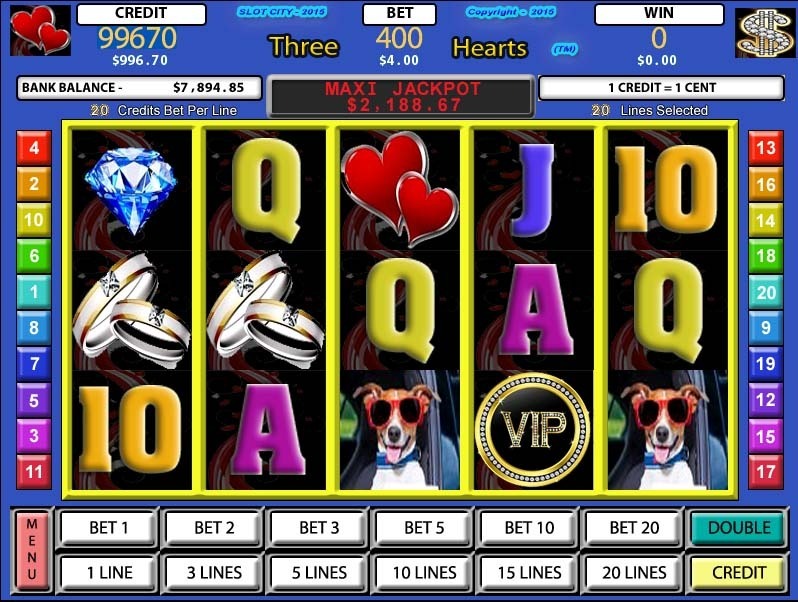 Three Hearts is a 5-Reel, 20-Payline, Australian style poker machine with a Hearts theme. 3 or more scattered trigger the feature. Upon winning the feature, you are awarded 15 free-games with all wins multiplied by 3. Free-games can be won again during the feature.